Once they get started, there's no stopping them. The City Council in Santiago, Chile is planning to implement 1000 km of bike paths and lanes in the city. Public transport in Santiago leaves much to be desired, which has caused a massive increase in bicycle traffic. Over the past four years there has been a 17% increase of of cyclists in the centre of the city. At the same time, interest groups have pressured the city council to do something about better conditions for the cycling inhabitants. The authorities have now promised the sum of 48 billion Chilean pesos [€67 million / $96 million] over the next three years to build 1000 km of bike lanes and paths. The drastic increase in cycle traffic also means that Chileans are buying more bikes - and those who can afford it prefer quality European bicycles. 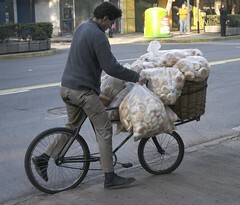 If anyone out there can tell us more about this fantastic, blossoming bike culture in Chile's capital, please do so!